A flower’s corolla is made up of a characteristic number of petals, most often 3, 4 or 5. These may be separate from one another (choripetalous, also called polypetalous), or fused into a single compound unit (sympetalous). 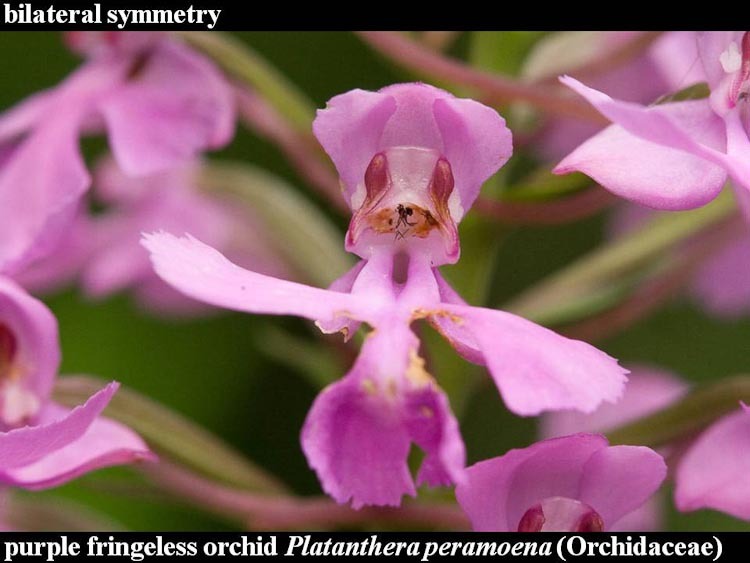 Here are some examples, starting with a choripetalous (polypetalous) flower. Below, wood poppy. This is a spring wildflower of rich woods. 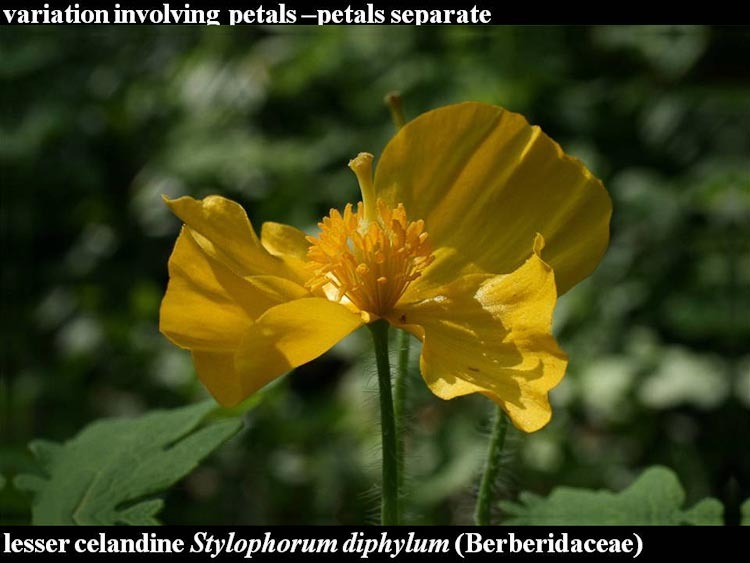 Wood poppy flowers have separate petals, i.e., they are choripetalous (syn: polypetalous). Below, bottle gentian. These bottle-shaped flowers have 5 petals fused along their entire length, with a small orifice at the top that is flexible enough to permit a bumblebee to enter the bloom. For the photo, two flowers in the foreground were split lengthwise to reveal the interior. 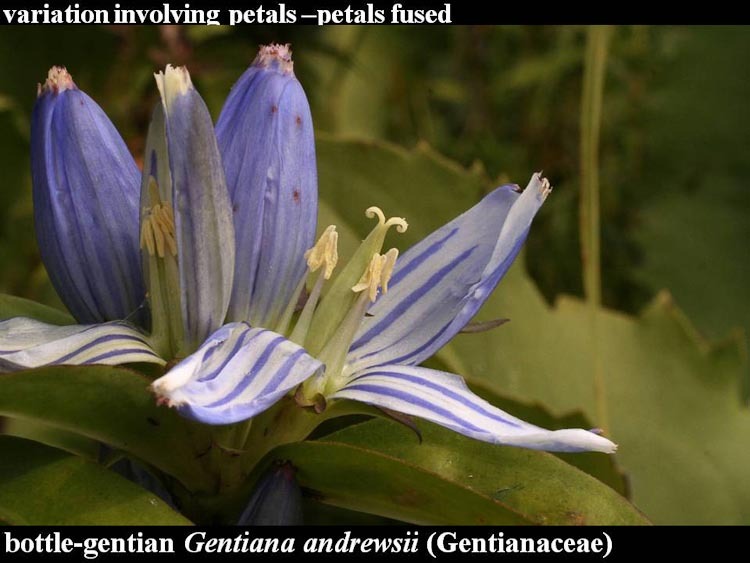 Gentian flowers are sympetalous (syn: gamopetalous), having 5 fused petals. Whether separate or fused, all of a flower’s petals may be identical in size and shape, resulting in a flower with radial symmetry (actinomorphic). Contrariwise, a more intricate, bilateral symmetry (zygomorphic) shape may induce pollinators to orient themselves in a particular manner that maximizes the likelihood that pollen will be deposited and/or removed from the flower. Here are some examples, starting with radial symmetry. Below, see bouncing bet. This is an introduced weed in the pink (carnation) family. 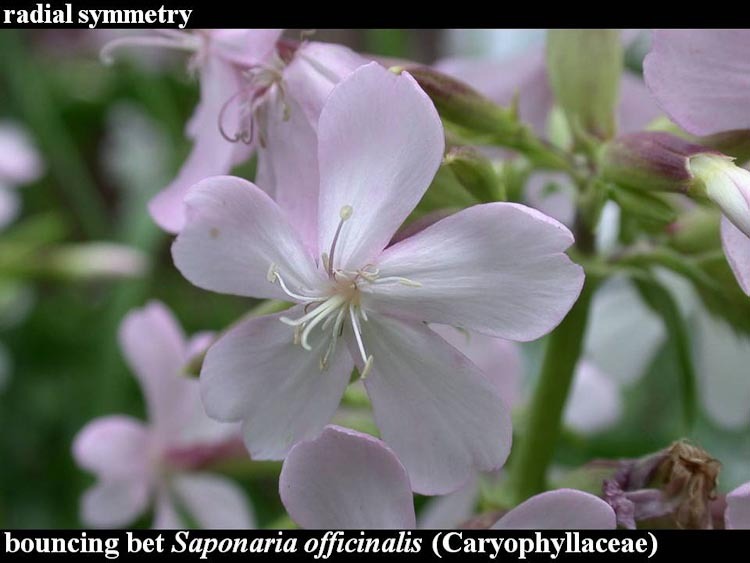 Also called “soapwort,” its crushed leaves mixed with water can produce a cleansing lather. Bouncing bet has actinomorphic flowers. Bouncing bet has actinomorphic flowers. Below, yellow star-grass. This is a spring-blooming prairie wildflower. Like most monocots, it has linear leaves and flower parts that are in threes or multiples of three. The flowers are actinomorphic (radially symmetric). 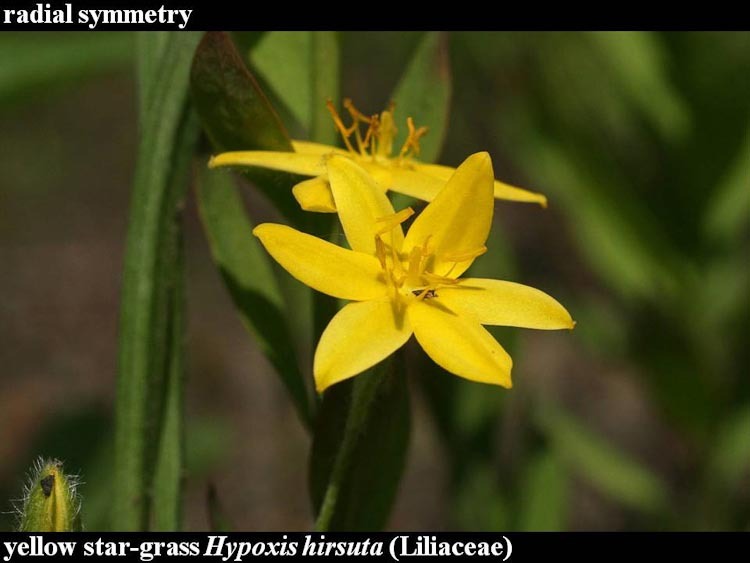 Yellow star-grass has radially symmetric (actinomorphic) flowers. Below, hedge bindweed. 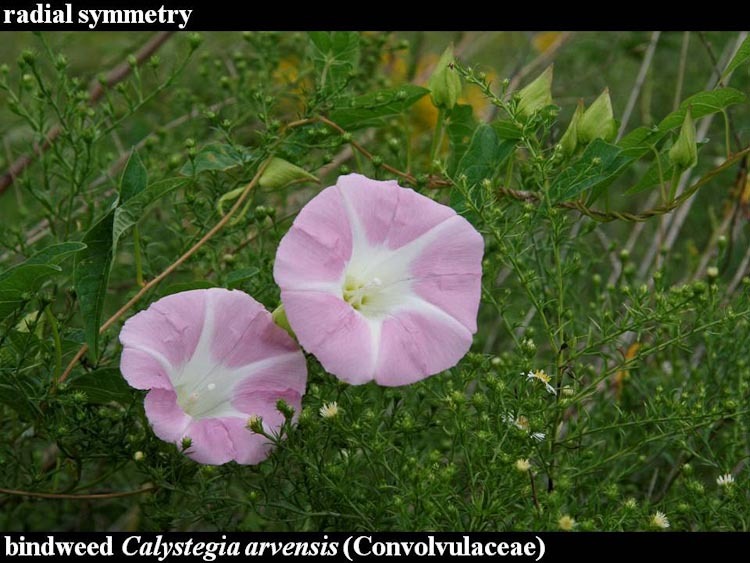 This extremely common native vine is related to the morning-glories (Convolvulus species). The corolla is sympetalous and also has actinomophic symmetry. Hedge bindweed flowers are actinomorphic. Below, striped creamy violet. 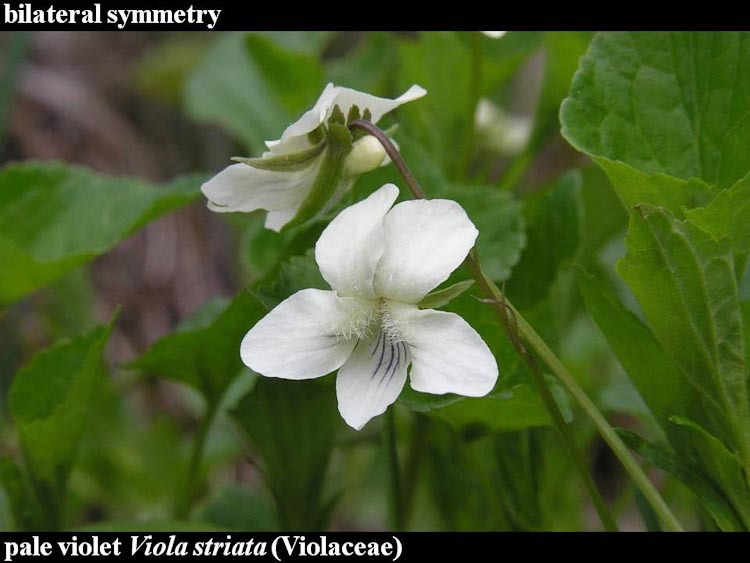 Over the course of a season, many violets produce two types of flowers: (1) early there are these showy ones that attract pollinators to promote cross-pollination, and (2) during the summer, inconspicuous ones that never actually open, as they self-pollinate in the bud. The showy flowers are strongly zygomorphic (bilaterally symmetric). Note that the lowermost petal is prolonged backwards into a nectar-filled sac-like “spur” that encourages a bee to poke her tongue deep into the bloom. Striped creamy violet has bilaterally symmetric (zygomorphic) flowers. Below, cardinal-flower. This is one of our very few red wildflowers, a cue that entices hummingbirds. (The other red ones are columbine (Aquilegia canadensis, family Ranunculaceae), royal catchfly and fire-pink (Silene regia and S. virginica, family Caryophyllaceae). 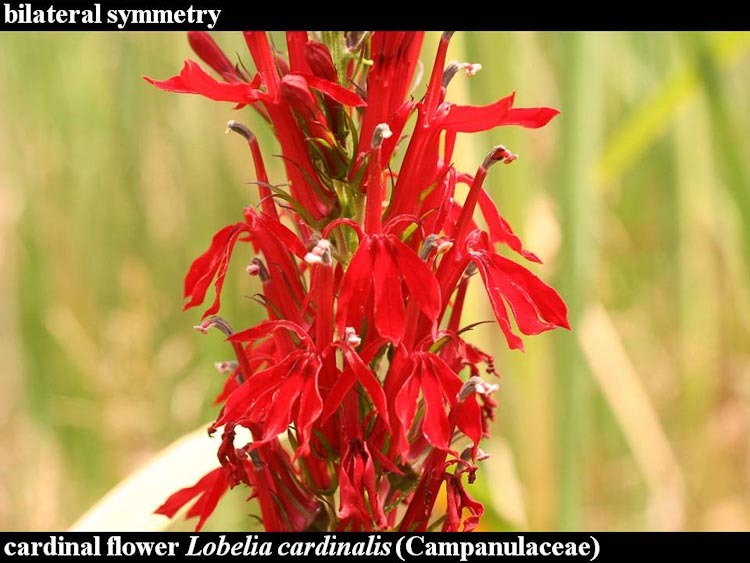 Cardinal-flowers are strongly zygomorphic. Below, purple fringeless orchid. Mainly because of their diversity in the tropics (where many live as epiphytes perched on trees), the orchid family is a huge one. Here in the temperate zone, orchids are a minor component of the flora. They exhibit a number of exquisite floral modifications, the best of which is a feature shared with milkweeds: the pollen grains are adherent in waxy masses transferred as a unit rather than as individual grains. Orchid flowers tend to be strongly zygomorphic. Purple fringeless orchid has strongly zygomorphic flowers.